Bacon Goddess: Oh Google, what have you done? Recipe search? The Google added a recipe search! 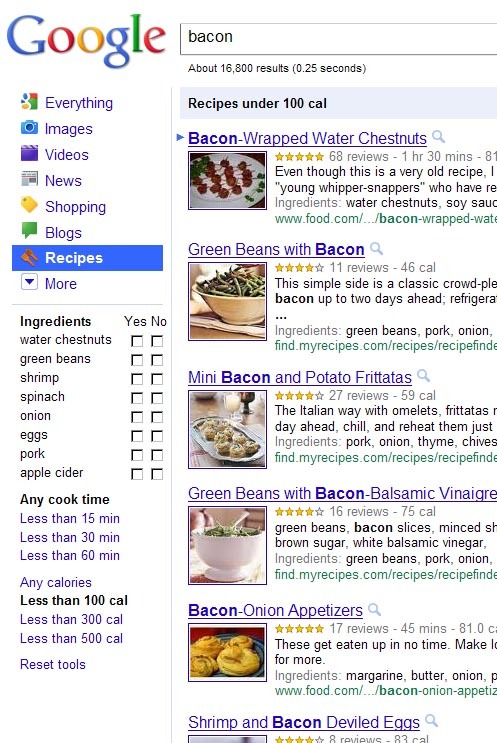 So... now when you're in the mood for a nice bacon recipe you can just go to the Google and type in "bacon". Yeah, okay, so I'd rather have you go to my bacon recipes page, since I'll be pre-sorting all the REALLY good bacon recipes out for you there, but I think this is going to be a great tool for those of us who love to cook! Now I just need to read up on how to get the Google to list my stuff!